War of the Spark is nearly here—and so is the end. What it's the end of you'll have to wait and see (Ravnica? The Gatewatch? Bolas? Fblthp?! ), but we're going to be doing something a little different with preview season that will take you along for the ride and tell a story through the cards. First, the official War of the Spark story by Greg Weisman will be available in book form at the end of April. You can check out the novel and see how to preorder it here. 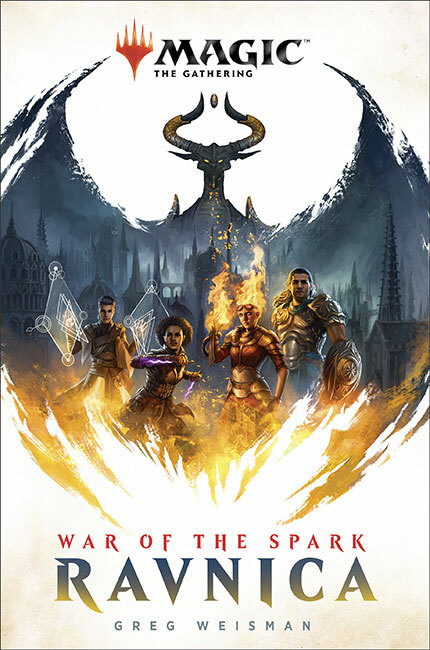 Cards paint a picture, but the official canon version of events during War of the Spark is contained within the pages of the book. But the cards tell a story as well. For this preview season, we're going to be doing a few cool things that will have you scouring the internet for the next chapter in the saga each day. Starting this weekend with the Mythic Invitational and PAX East, we'll be previewing cards in what we're calling scenes. All cards previewed on a single day will have a connection to a story point, an event, or a key location in roughly chronological order. Then, starting Monday, we'll be posting scenes of around four or five cards to paint the picture of what's happening. Think of them like little storyboards using the cards, the art, and the flavor text to give an overview of what's happening. Every day we'll update our storyboard (which you'll find on DailyMTG.com) with a new scene. Check back every day or periodically to follow an outline of the story. Not every card will be put on the storyboard—but we will be previewing every card along the way. And there's the other twist. Normally we do two weeks of previews with a significant number of commons and uncommons revealed on the final day. This time we'll be previewing everything—from the most mythic of rares to the most common of commons—all along the way for the next three weeks. By the time we get to the final day of previews, everything will have already been revealed. You'll not only get a sense of the story, you'll also learn more about the mechanics and the Draft environment than preview seasons past. In this way, you'll learn more about the characters, the story, the events, and, yes, the end than ever before during a preview season. We hope you enjoy this different take on preview season and that you follow along as we head toward a climax that's been building for years. Be sure to tune in to the Mythic Invitational coverage this weekend to get your first looks at War of the Spark!